In 2014, Increasing Human Potential had the pleasure of speaking with experts across the globe to learn more about how they are using UAS, the potential UAS carry, and where this emerging technology will take us in the future. In case you missed some of our interviews, we decided to share some of the best and most interesting tidbits we learned from our interviewees. Meet our experts below, and happy (almost) 2015! On the humanitarian uses of UAS…. Paola Santana studied at Singularity University, Matternet aiming to transform how essential goods can be transported around the world using small unmanned aircraft. Adam Klaptocz is a cofounder of Drone Adventures and an engineer for senseFly, which develops UAS for use in agriculture and mapping. He founded the organization in March 2013 and has since flown missions to map the Matterhorn, aid rebuilding efforts after the earthquake in Haiti, and survey areas affected by the tsunami and resulting nuclear disaster in Fukushima, Japan. Simon Johnson is a director of the La Fondation Bundi, which sponsors the Flying Donkey Challenge. The challenge is working to pioneer a new transportation system using unmanned aircraft systems to deliver cargo over long distances, starting in Africa. Johnson is also a board member of the Swiss National Centre of Competence in Research in Robotics (NCCR). On using UAS for disaster response…. Daniel Serrano is a project coordinator at the Integrated Components for Assisted Rescue and Unmanned Search operations (ICARUS) and the head of unmanned systems at ASCAMM in Spain. His team recently worked on a project using UAS for search and rescue and mine detection following major flooding in Bosnia. Charles Devaney is the director of Project HALO (Help and Locate Operations) at Linking the World. 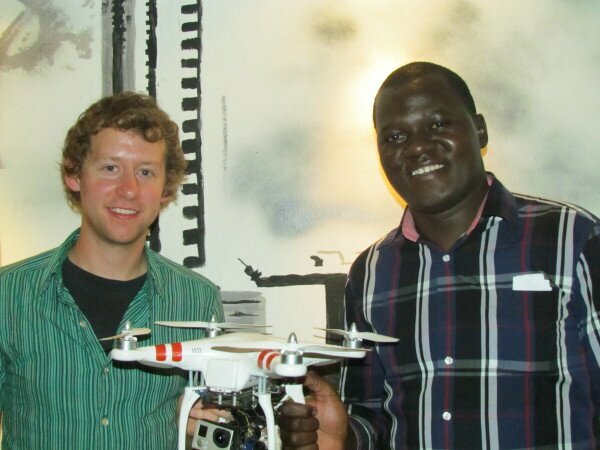 He recently won the Drone Social Innovation Award for his work in disaster response following Typhoon Haiyan in the Philippines. Linking the World is an international humanitarian aid organization that has worked in over 40 countries. After Typhoon Haiyan, I was on a panel at the United States Military Academy at West Point, where I presented the work I had done in Philippines using UAS. Linking the World’s CEO, Mina Chang, attended that panel with an interest in UAS and saw the value in the technology. Once we connected we decided to start a program within the organization called Project HALO, of which I am the director. 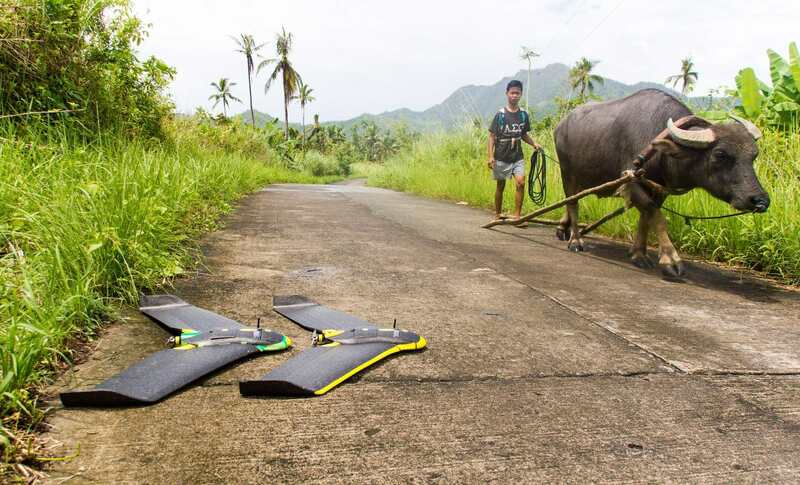 In the wake of Typhoon Haiyan, We used both fixed-wing and multirotor UAS in the wake of typhoon to assess the level of damage that was caused by the storm. The information was used by local government and municipalities in their efforts to rebuild. We also imaged hundreds of square kilometers of area to assess damages to natural resources, such as rice and coconuts. Robin Murphy is the Raytheon Professor of Computer Science and Engineering at Texas A&M University and directs the Center for Robot-Assisted Search and Rescue (CRASAR). She has used robotics at disaster sites around the country, including the 9/11 World Trade Center attacks, Hurricanes Katrina and Charley, and the Crandall Canyon Utah mine collapse. She is also a founder of Roboticists Without Borders. On using UAS for environmental protection…. Lian Pin Koh is a cofounder of Conservationdrones.org, (along with Serge Wich) a project dedicated to sharing knowledge about the use of UAS for conservation and ecological research. Koh’s teams have done research in Sumatra, Madagascar and the Republic of the Congo. He is also an assistant professor at the School of Earth and Environmental Sciences, University of Adelaide. On an interview we asked Lian Pin Koh about his recent TED talk on using UAS to protect wildlife in Nepal and search for orangutans in Sumatra. We have been helping the Directorate of National Parks and World Wildlife Fund (WWF) Nepal in the country to develop a UAS for patrolling national parks. They are keen to use this technology to combat wildlife poaching. After several trips to Nepal and working with these partners on the ground, we customized two variants of UAS for them that can be flown completely autonomously from takeoff to landing. They have a smaller UAS that flies for about 20 minutes, and a bigger one that flies for 40 to 50 minutes. They will use these UAS to conduct aerial patrols between existing checkpoints to complement their foot patrols. UAS will change conservation by reducing the cost of doing conservation and research. There are many potential uses that have not been developed yet, including the use of drones for tracking wildlife, and for retrieving images from camera traps placed in the forest. On using UAS in agriculture…. Donna Delparte is an assistant professor in the Department of Geosciences at the Idaho State University. She is currently working with farmers in Southeast Idaho to study how UAS can be used to help assess crop health and detect potential issues. I currently have a couple of COA [certificate of authorization] applications in with the FAA [Federal Aviation Administration] to fly hazard areas for snow avalanches and landslides. I am very excited about utilizing high-resolution imagery and terrain information to map and model avalanche and landslide potential. My current U.S. Department of Agriculture-supported research project this summer has been to examine agricultural crop health with UAS data. I have a fantastic graduate student with extensive agricultural sector work experience, Mike Griffel, partners at Boise State University, Idaho National Labs, University of Idaho; and the cooperation of farmers in southeast Idaho. We are currently looking at novel approaches to crop health and threat detection to assist farmers in the identification of potential issues. We’ve been working with farmers on concerns which are critical to them and their bottom line. It will be essential to identify what different sensing approaches are appropriate throughout the growing season. This research will continue next year, and what we’ve learned over this summer will inform our decisions for next year’s data collection. Robert Blair is one of the pioneers of the use of UAS for precision agriculture in the U.S. 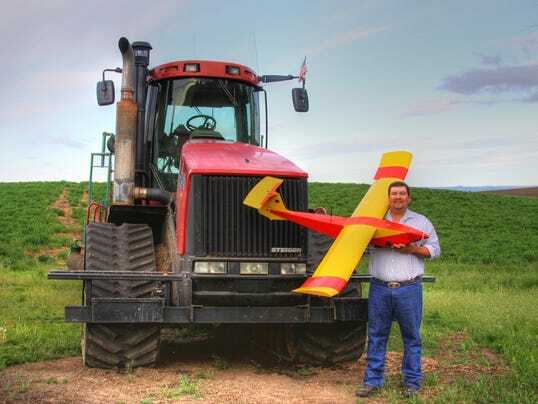 Since 2006, he has been using UAS on his farm in Kendrick, Idaho. He blogs about his experiences at The Unmanned Farmer. My personal use of UAS successes has been to use the information to identify wildlife damage in crops. The saying a picture is worth a thousand words is very true with UAS images. Combining the images with yield data from my combine helped to show the size of area and, to some extent, the amount of damage. I have also used UAS for crop insurance purposes, which is similar to animal damage. UAS help in the decision-making process by providing high-resolution, timely data. Robbie Hood is an atmospheric scientist that has served as the director of the National Oceanic and Atmospheric Administration’s Unmanned Aircraft Systems Program office since 2008. Jeremy Mathis is a supervisory oceanographer at the National Oceanic and Atmospheric Administration’s Pacific Marine Environmental Laboratory and is an affiliate professor at the Institute of Marine Science at the University of Alaska Fairbanks. He has worked with NOAA using unmanned systems to collect data in the Gulf of Alaska related to the health of our oceans. We asked Jeremy how unmanned systems are useful in studying oceanography, specifically studying ocean acidification in coastal regions this field, and what do unmanned systems offer over traditional data collection methods? Brian Argrow is a professor in the Aerospace Engineering Sciences Department at the University of Colorado Boulder, and cofounder of the university’s Research and Engineering Center for Unmanned Vehicles. His research on UAS has attracted attention for gathering data on supercell storms. Future uses of UAS in the National Airspace System appear to be limited not by the imagination, but by the pace of policies and regulations that allow or prevent their use. The lack of the policies, rules, standards and regulations for routine access of UAS to the NAS remains the greatest limitation. One of my RECUV colleagues, with a wealth of experience in the telecommunications industry, likens the current opportunity to develop policies and rules favorable to the safe operation of UAS in the NAS to what has been witnessed for the telecommunications industry. We have an opportunity for the development of sensible policies and rules that will foster fair commercial development while ensuring public safety. The primary challenge is to educate politicians, agencies and UAS experts on the current regulatory environment so that sensible regulatory progress can replace the sensational stories that are now coming at a pace of several per week. Hopefully, we will someday look back on the aftermath of the FAA Modernization and Reform Act of 2012 with similar regard as we do for the legislation and rulemaking that have enabled the regulated emergence of cable, wireless and Internet services that have revolutionized all aspects of contemporary life. Jeff Sloan is the current UAS project manager in the USGS National Unmanned Aircraft Systems Project Office. He has worked for the U.S. government for more than 25 years for various agencies focusing on cartography. Marty Rogers is the director of the Alaska Center for Unmanned Aircraft Systems Integration at the University of Alaska Fairbanks. Last year, the center was named an FAA UAS Test Site and recently was cleared by the FAA to begin flights. Rogers is retired from the U.S. Air Force. Alaska, along with our test site partners Oregon and Hawaii offer a huge diversity in climate and geography. It’s not just hype; flying in Alaska can be a genuine challenge due to climate extremes. This tests not just equipment capabilities, but tests pilots, observers and researchers. We have designed a multi-rotor UAS in house that is specifically designed for high-latitude operation. Last year a manufacturer of a UAS from the lower 48 came to Alaska for a research project, and the system would not operate because the outside temperature was -10 F. We fly at temps down to -30 F, and this requires equipment that is designed and built for extreme conditions. Because of the increased emphasis on the Arctic, from oil and gas exploration, environmental and wildlife management, and sovereignty concerns, UAS can be a logical tool for more efficient and safer research. But there can never be any confusion regarding where you are flying, and in the Arctic that reach-back for needed resources may be a very long way away. Todd Jacobs is a project scientist on the National Oceanic and Atmospheric Administration OAR Unmanned Aircraft Systems (UAS) Program and the Deputy Superintendent for Operations and Administration of the Channel Islands National Marine Sanctuary. He and his team have used UAS to survey wildlife in California and the Olympic Coast of Washington. They have also conducted experiments on monitoring debris on the Olympic Coast of Washington and in Hawaii.